A Cornish school is fighting to remove offensive comments about two pupils and a teacher from internet social networking site Bebo. But Helston Community College says despite its complaints about the comments, they have remained online. The comments have caused concern at the school which has now asked the police to take action. Bebo says it has an abuse report system and will freeze accounts when they are used inappropriately. The college has banned social networking sites such as Bebo from school computers. 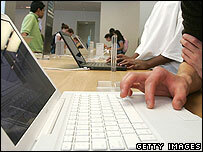 It has also called on parents to monitor what their children are doing on their computers outside school time. Bebo was set up as a photo sharing site in January 2005, then turned to social networking later that year. It is thought to be the sixth biggest site in the UK, with 30m users worldwide. Head teacher Dr Patrick McGovern said: "We have tried to have them blocked, but nothing has happened. "We have now put the matters in the hands of the police. It is an awful thing to spread a hate campaign. Abusive comments about pupils at another school in Cornwall were removed this week from Bebo after intervention by police. Devon and Cornwall police confirmed they were investigating the complaints. The school started an IT awareness campaign for parents a year ago and school councillor Karen Harvey monitors social networking sites regularly for abuse. Bebo, which launched an anti-bullying tool on its website last year, said anyone who uses its site must comply with its rules and regulations. Members can highlight inappropriate content or behaviour and members can check what other people are posting. Education Secretary Alan Johnson earlier this year called on website publishers to prevent "cruel and relentless" harassment of teachers. The Devon and Cornwall force has six community safety teams in Cornwall trying to counter cyber bullying. PC Dave Thompson, youth intervention officer in Restormel, said: "The internet is a growing area and as it develops I think we are likely to see a lot more of this kind of problem." How do you stop the cyberbullies?